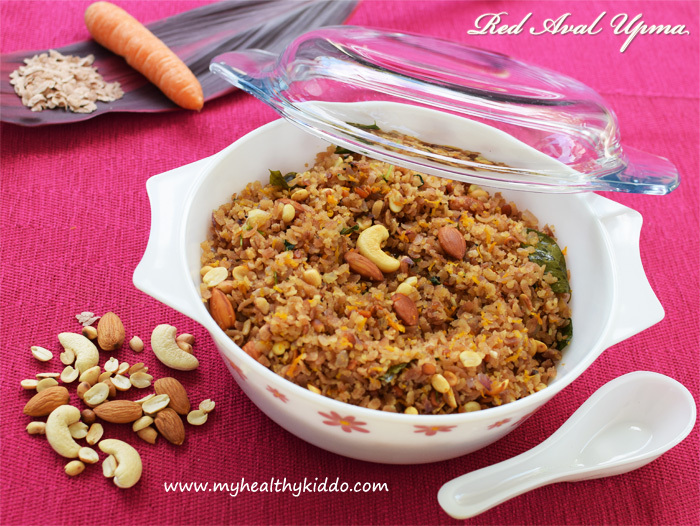 Red Beaten Rice Nutty Crunch/Sivappu aval upma is a wholesome recipe that calls for nutriments required for dads-to-be/moms-to-be . This healthy breakfast is apt for pregnant & Lactating ladies too. As it demands more nuts, it would be hard for children under 4 years to have it as a full breakfast, though they can grab a spoon or two when you eat. 1. Finely chop onions and grate the carrot. 2. Fry cashews and Almonds in oil. Take them out and keep it aside. To the same oil, add mustard seeds, urad dal and bengal gram. 3. Once browned(Do not char it), add curry leaves,onions and green chillies. Once onions become translucent, add carrots and coriander leaves. 4. In the meanwhile, rinse aval/poha twice in water. Squeeze out the excess water and keep covered just not to let it dry. 5. Once carrots change color, add aval/poha. Add salt and give a quick stir. 6. Add fried cashews and almonds. Add dry roasted peanuts. Give a quick stir and switch off immediately. Transfer to a bowl asap. Serve immediately! Choose thin beaten rice. If you opt for thick one, you would need to soak it in water for 5-10 mins just after rinsing. 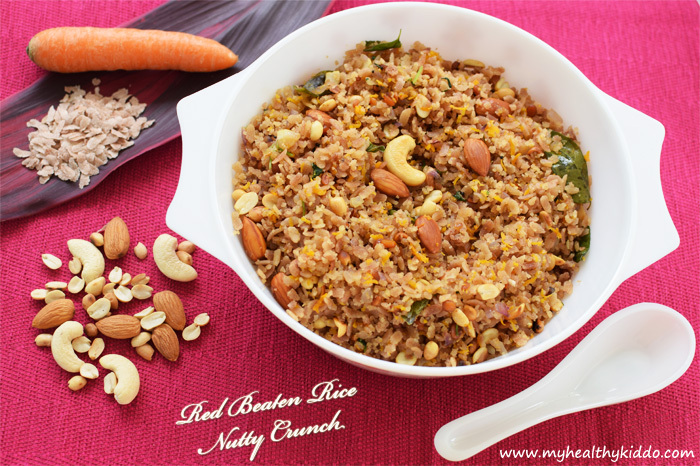 This is actually brown rice aval. 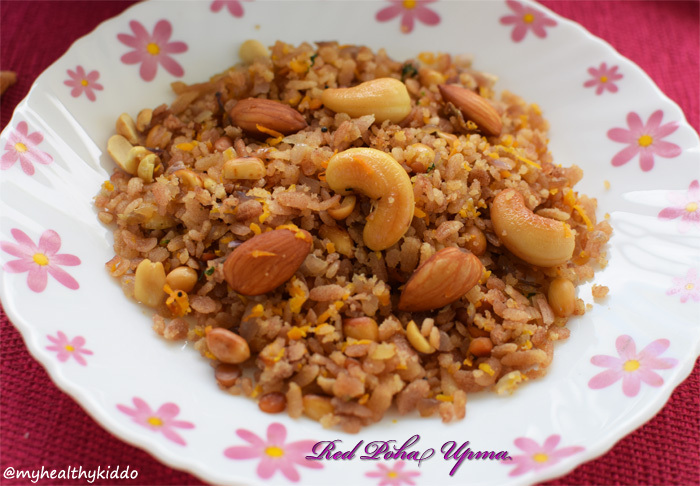 In my locality, they call it as Red rice aval and so I stick to the same name. Once prepared, consume within an hour as it would dry over time and challenge you to chew hard! . Also, do not leave it in the hot pan as it starts to dry. Transfer to a serving pan and keep covered. 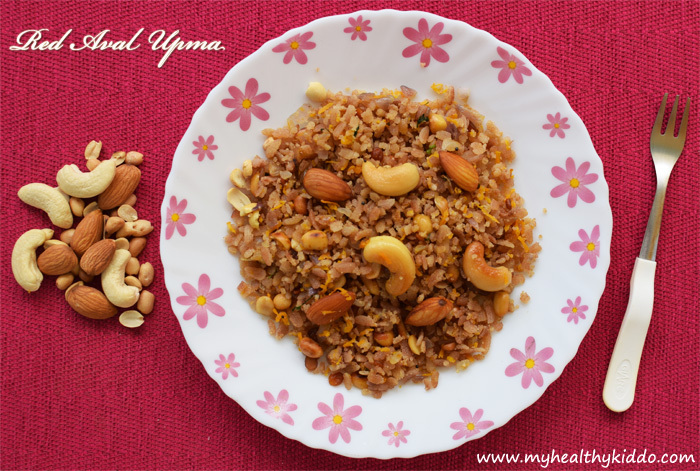 Cashews and Almonds can be roasted in Microwave oven instead of oil-fry. Photos are very nice 🙂 your about me page is very impressive Shyam 😉 as usual u r rocking. Waiting to see more and more varieties.